With the addition of e-commerce, Scientific Minds now offers parents and teachers access to the company's award-winning digital science products. We created our new biology and chemistry products in an interactive platform so that …students can use them for self-directed learning outside the classroom. Scientific Minds just keeps growing. In addition to eight products created in as many years, the company has added an e-commerce function to its website. Educators, parents, and students can now take advantage of online transaction processing to purchase both Science Starter subscriptions and merchandise. Prior to the e-commerce addition, all sales were directly to school districts. Built from state standards, the Science Starters quickly became a teacher favorite. A unique teacher-guided feature supports beginning teachers and teachers who are teaching out of their content area while still providing flexibility for experienced teachers. As new products were developed, president and founder Kathy Reeves began to see a market for individual subscriptions. "Our original products were developed as teacher tools for whole-class instruction. We created our new biology and chemistry products in an interactive platform so that teachers have more features for classroom use and students can use them for self-directed learning outside the classroom. These are fantastic products that 'chunk' information and provide feedback so that students can learn in reasonable periods of self-study." Reeves says that the Science Starters products are ideal for flipped teaching, where students use online learning tools for traditional lecture material and come to class prepared to ask questions and apply their learning. Science Starters programs are available for K-5, 6-8, biology, and chemistry. In the past few months, the middle school program has been updated to the new interactive platform as well. While selling student accounts to schools along with the teacher subscriptions, Scientific Minds began developing the e-commerce system to market directly to parents and students who need an at-home science supplement. There has also been a demand from teachers who want to purchase the product for themselves. In addition, the company recognized that Science Starters are an excellent fit for the home school learning environment and began marketing to home school families. Once the e-commerce function was put in place, Scientific Minds began seeing sales on all fronts. Travis Reeves, director of marketing for the company, saw another opportunity. "We've given away a t-shirt to workshop attendees at conventions that teachers absolutely love. Many want extra shirts to take home to friends, but we obviously can't provide unlimited numbers to them. They started emailing me asking if they could buy the t-shirts, and I thought, 'Why not?' So we created a merchandise page within the e-commerce system." In addition, Scientific Minds began creating manipulative lab kits, and over 800 kits were donated to teachers at the 2013 Conference for the Advancement of Science Teachers in Texas. When teachers began requesting additional labs and refill kits, they were added to the merchandise page as well. 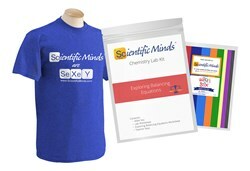 Scientific Minds offers a free 7-day trial for each of its Science Starters products at http://www.ScientificMinds.com.